I can't really believe that I haven't put anything up about this before now . . . ! Oliver Swann was the guy who dragged me out of the Dark Ages and into the techno-revolution and all this webby stuff. He first contacted me in 2005 about having a mention on his Green Woodland site. I sent him a load of blurb and a disc of photos - he phoned me shortly after to say "There's too much there for a mention - you need your own website. You've got a good domain name which hasn't been taken and I've reserved it for you". 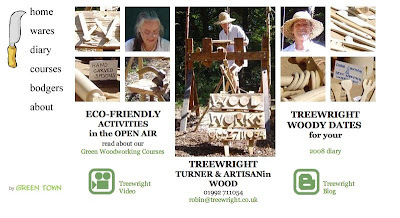 I had thought that I would have a website in the future and I would have a lot of input in how it looked, typefaces etc but from the stuff I sent him it just popped up - www.treewright.co.uk - clear, concise and simple. My website has been so successful that a large proportion of my new business comes from it. He regularly updates the site and has coached me in the ways and means of cyberspace. He also suggested various additions and improvements to the site. It is thanks to him that you can regularly read my diary on Blogspot as it was he who suggested starting it. If you're thinking of having a website - he's your man. Check him out at Green Town. Back to reality now I have to sort out some wood and sharpen my tools ready for tomorrows demonstration at Woodlands Farm Trust Spring Show.